How romance began, blossomed and withered all in the space of an epic 98. I first saw her at the Arts Centre. The University’s cricket-loving population was sprawled under a giant screen, a distinctly visible demarcation between hundreds in blue and an equal number in green. Actually, I had seen her before — even held the door open for her, thanked refreshingly by a ‘shukriya’ instead of the ubiquitous ‘cheers’ — but with her beaming and bouncing and cheering, looking drop-dead delicious in her Pakistan tee-shirt waving some rude-yet-clever slogan at us, 1st March 2003 was the first time I had actually stopped to look. 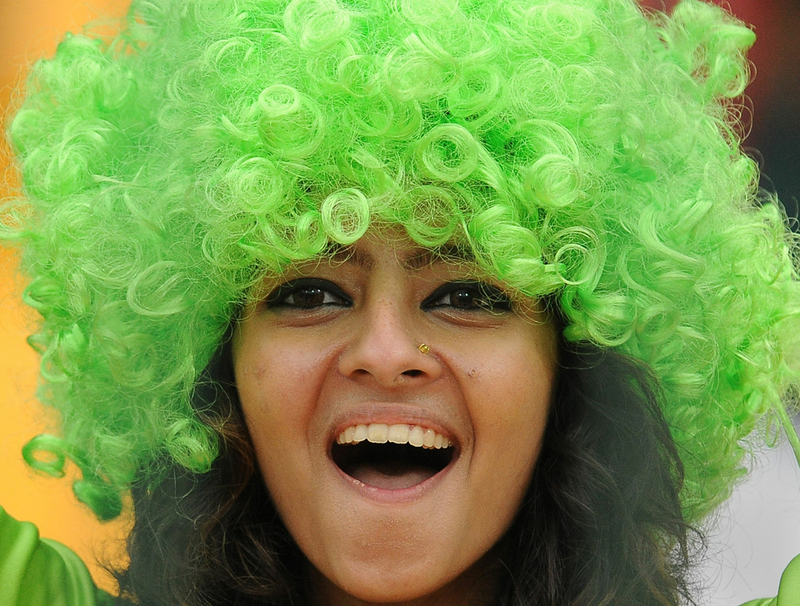 An enthused Pakistani fan cheers her team to victory against Canada. Wasim Akram began with two dot balls. I, with shaggy hair much bluer than my team tee, kneeled next to a friend and watched Sachin Tendulkar cream the next ball to the ropes. Obviously, I stayed on that left knee for more than half the match, while Sachin layeth the smacketh down, but, every time He wasn’t on strike, I pivoted back. To auburn curls, light eyes, an electrifying smile and lots of flag-waving sass. Eye-contact was made over Shoaib getting spanked, and there was much playful slogan-warring; she even thumbed her nose once and irresistibly stuck out a sharp tongue. I decided that I would keep the post-match gloating to a minimum, and instead offer to take her out for a consolatory slice of pie or something. Boundary. Six. Pivot. Boundary. Dot ball. Pivot. Pivot. Halfway down the 28th over, Tendulkar was out. On 98. We sighed and fretted, but we knew he’d already given us an innings more special than many of his tons, and that the match by now was won. We patted each other on the shoulder as if we’d been running those ones and twos, smiled and applauded. Pivot. She stood atop a table celebrating the master’s dismissal, her eyes gloriously, gorgeously aflame as she mouthed and gestured ‘get out of here.’ To Sachin. If my left knee wasn’t already ground into the carpet, it might have buckled. The friend amused by my Pakistani preoccupation clapped his arm around my shoulder. I’m not sure, but I think he might have offered me pie. Or something. You get it, right? I’m all for a pretty girl vociferously egging her team on and willing ours to lose. That’s passion, and that’s sport. But doesn’t Sachin move beyond merely geographic boundaries? Doesn’t everyone just want to watch Him bat? From opposing bowlers to infamously partisan Australian crowds, they all applaud and marvel and wistfully, briefly picture Him wearing their own colours. In the IPL, I used to support Kolkata Knight Riders, but when we faced Sachin all I wanted to see was that legendary drive straight past the bowler. Or an audaciously square cut. Or just a bullying six. We all want to watch Sachin bat — like Warne turn or Murali decieve or Wasim york or McGrath castle — because that is as good as cricket gets. Many years ago, at an Eden Gardens game, my mother cheered Viv Richards on to hit a six. This was admittedly because she wanted to see the handsome Nawab of Pataudi, then fielding near the outfield, to get closer to her stands while retrieving the ball. Still, dubious motive aside, her aghast fellow-spectators had to concede that they all wanted to see the same piece of savagely sculpted poetry. Because magic is for everyone. I don’t know where that girl from eight years ago is, or even her name. I just wish, by now, that she’s learnt to appreciate Tendulkar. Because just watching cricket is a darned sight less lyrical without Him. And Sachin belongs to us all. Clearly continues to live a philistine. and thinks Sanjay Leela Bhansali wrote Devdas. I had a similar short-love-story moment. Mine was 1997, Gold Flake Open, Nungambakkam Stadium. Boris Becker and I can’t remember who. Becker did his famous ‘Becker’, leapt in the air to reach a neat drop shot, missed it. Handsome lad in the vicinity cheered. I think I slapped him with my left eye alone. In short, I understand this sentiment. Some things are universal, and should be. I’m falling in and out of love all the time. Sometimes, life seems an unending series of short love stories with no ‘walking-happily-in-the-sunset’ moment on the horizon.